Facts about Mud Wasps, "Scientific name for Mud Wasp is Sceliphron caementarium". Mud Wasps are also known as mud dauber, dirt dauber, dirt digger or dirt diver. The Mud Wasp belong to the families of sphecidae or crabronidae. The Mud Wasp are known as mud wasps because of building their nests from mud. The Mud Wasp have similar characteristics despite belonging to different families. They are long, slender at about 1 inch (2.54 cm) in length. Unlike other wasps that are aggressive, the Mud Wasp don’t sting easily even when provoked. The common mud wasps are black and yellow mud wasps, metallic blue mud wasps and the organ pipe mud wasps. Different research carried out has given different information on these species though at the bottom of all they have some similar characteristics. Mud Wasps are predators and the females are responsible for building nests and hunting for food. The Mud Wasp mostly feed on small spiders like crabs, orb weavers and other jumping spiders. In most of the times you will find mud wasps hunting for the insects in dense vegetation. Adults whether male of female also love drinking flower nectar. The male Mud Wasp brings spiders in the nests and stocks them for food. This is an advantage to their offspring who feed on them. The Mud Wasp can either take the particular spiders of their choice and of different sizes. The Mud Wasp use their sting to paralyze the spiders and then drag them to the nest. The Mud Wasp are aware of where o find them and so when they go hunting they have the specific places that they visit. The nests are built by females who use their mandibles. This varies with the different species of the mud wasps. One of the biggest wasps of the family of sphecidae, organ pipe Mud Wasps build nests that look like cylinders since their nests are cylindrical in shape. One can mistake them with pan flute. They are built in horizontal or vertical faces of walls, caves that are sheltered, overhangs and bridges. The metallic blue Mud Wasps do not build nests. The metallic blue Mud Wasp rely on abandoned nests that have been built by other species. The most common nests that the metallic blue Mud Wasp use are that of black and yellow mud wasps. They renovate the nests by carrying water and recondition them. 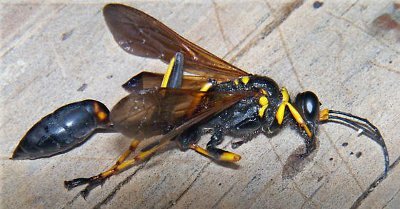 The black and yellow mud wasps that also belong to the family of sphecidae build nests that have a series of cylindrical cells. These cells are plastered to form smooth nests that are the size of lemons. The Black and Yellow Mud Wasp nests are simple and have an urn shape. The Black and Yellow Mud Wasp attach the nests to cracks and corners. In each nest, one egg is laid. So they cluster several nests together and then plaster mud over them. Year after year, the three species use the same nests sites. In return large nests are formed and used by many wasps thereafter. Even bees and insects can use the same nests. The problem is that this congestion is very dangerous. You will realize that the offspring are always crowded at the same place and so in cases of predation, predators find them in one place. So they use these wipes to feed their own offspring.